The Khwarazmian dynasty ( /kwəˈræzmiən/ ;  also known as the Khwarezmid dynasty, the Anushtegin dynasty, the dynasty of Khwarazm Shahs, and other spelling variants; from (Persian : خوارزمشاهیان‎, translit. Khwārazmshāhiyān "Kings of Khwarazm") was a Persianate    Sunni Muslim dynasty of Turkic mamluk origin. The dynasty ruled large parts of Central Asia and Iran during the High Middle Ages, in the approximate period of 1077 to 1231, first as vassals of the Seljuqs  and Qara-Khitan,  and later as independent rulers, up until the Mongol invasion of Khwarezmia in the 13th century. The dynasty spanned 2.3  (or 3.6  ) million square kilometers. Khwarazm, or Chorasmia is a large oasis region on the Amu Darya river delta in western Central Asia, bordered on the north by the (former) Aral Sea, on the east by the Kyzylkum desert, on the south by the Karakum desert, and on the west by the Ustyurt Plateau. It was the center of the Iranian Khwarazmian civilization, and a series of kingdoms such as the Persian Empire, whose capitals were Kath, Gurganj and – from the 16th century on – Khiva. 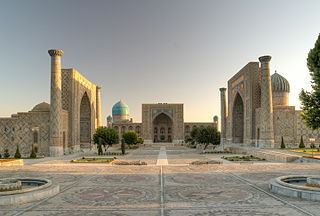 Today Khwarazm belongs partly to Uzbekistan, partly to Kazakhstan and partly to Turkmenistan. Qutb ad-Din Muhammad was the first Shah of Khwarezm from 1097 to 1127. He was the son of Anushtegin Gharchai. The Ghaznavid dynasty was a Persianate Muslim dynasty of Turkic mamluk origin, at their greatest extent ruling large parts of Iran, Afghanistan, much of Transoxiana and the northwest Indian subcontinent from 977 to 1186. The dynasty was founded by Sabuktigin upon his succession to rule of the region of Ghazna after the death of his father-in-law, Alp Tigin, who was a breakaway ex-general of the Samanid Empire from Balkh, north of the Hindu Kush in Greater Khorasan. The Qara Khitai, or Western Liao, officially the Great Liao, was a sinicized Khitan empire in Central Asia. The dynasty was founded by Yelü Dashi, who led the remnants of the Liao dynasty to Central Asia after fleeing from the Jurchen conquest of their homeland in the north and northeast of modern-day China. The empire was usurped by the Naimans under Kuchlug in 1211; traditional Chinese, Persian, and Arab sources considered the usurpation to be the end of the Qara Khitai rule. The empire was later conquered by the Mongol Empire in 1218. Sultan Ahmed Sanjar died in 1156. As the Seljuk state fell into chaos, the Khwarezm-Shahs expanded their territories southward. In 1194, the last Sultan of the Great Seljuq Empire, Toghrul III, was defeated and killed by the Khwarezm ruler Ala ad-Din Tekish, who conquered parts of Khorasan and western Iran. In 1200, Tekish died and was succeeded by his son, Ala ad-Din Muhammad, who initiated a conflict with the Ghurids and was defeated by them at Amu Darya (1204). Following the sack of Khwarizm, Muhammad appealed for aid from his suzerain, the Qara Khitai who sent him an army. With this reinforcement, Muhammad won a victory over the Ghorids at Hezarasp (1204) and forced them out of Khwarizm. Toghrul III was the last sultan of the Great Seljuq Empire. Ala ad-Din Tekish or Tekesh or Takesh was the Shah of Khwarezmian Empire from 1172 to 1200. He was the son of Il-Arslan. His rule was contested by his brother, Sultan Shah, who held a principality in Khorasan. Tekish inherited Sultan Shah's state after he died in 1193. In Turkic the name Tekish means he who strikes in battle. The Talas River rises in the Talas Region of Kyrgyzstan and flows west into Kazakhstan. It is formed from the confluence of the Karakol and Uch-Koshoy. It runs through the city of Taraz in Zhambyl Province of Kazakhstan and vanishes before reaching Lake Aydyn. Konye-Urgench – Old Gurgānj also known as Kunya-Urgench, Old Urgench or Urganj, is a municipality of about 30,000 inhabitants in north Turkmenistan, just south from its border with Uzbekistan. It is the site of the ancient town of Ürgenç (Urgench), which contains the ruins of the capital of Khwarazm, a part of the Achaemenid Empire. Its inhabitants deserted the town in the 1700s in order to develop a new settlement, and Kunya-Urgench has remained undisturbed ever since. In 2005, the ruins of Old Urgench were inscribed on the UNESCO List of World Heritage Sites. Blue Row Signifies vassalage of Samanid Empire . ↑ Rein Taagepera (September 1997). "Expansion and Contraction Patterns of Large Polities: Context for Russia". International Studies Quarterly . 41 (3): 497. doi:10.1111/0020-8833.00053. JSTOR 2600793. ↑ "Khwarazmian: definition". Merriam Webster. n.d. Retrieved 21 October 2010. ↑ "Persian Prose Literature." World Eras. 2002. HighBeam Research. (September 3, 2012);"Princes, although they were often tutored in Arabic and religious subjects, frequently did not feel as comfortable with the Arabic language and preferred literature in Persian, which was either their mother tongue—as in the case of dynasties such as the Saffarids (861–1003), Samanids (873–1005), and Buyids (945–1055)—or was a preferred lingua franca for them—as with the later Turkish dynasties such as the Ghaznawids (977–1187) and Saljuks (1037–1194)". ↑ C.E. Bosworth, The Ghaznavids:994-1040, (Edinburgh University Press, 1963), 237. ↑ C.E. Bosworth, The Ghaznavids:994-1040, 237. ↑ Rene, Grousset, The Empire of the Steppes:A History of Central Asia, (Rutgers University Press, 1991), 168. ↑ John Man, "Genghis Khan: Life, Death, and Resurrection", Feb. 6 2007. Page 180. Ala ad-Din Muhammad II was the Shah of the Khwarezmian Empire from 1200 to 1220. His ancestor was a Turkic slave who eventually became a viceroy of a small province named Khwarizm. He is perhaps best known for inciting the Mongol invasion of Khwarezmia, which resulted in the utter destruction of his empire. Atsïz was the second Shah of Khwarezm from 1127 to 1156. He was the son of Qutb ad-Din Muhammad. Kuchlug was a member of the Naiman tribe of western Mongolia who became the last ruler of Qara Khitai empire. The Naimans were defeated by Genghis Khan and he fled westward to the Qara Khitai, where he became an advisor. He later rebelled, usurped the throne and took control of Qara Khitai. He was killed in 1218 by the Mongols and the domain of the Qara Khitai absorbed into the rising Mongol Empire. The Seljuk Empire or the Great Seljuq Empire was a high medieval Turko-Persian Sunni Muslim empire, originating from the Qiniq branch of Oghuz Turks. At its greatest extant, the Seljuk Empire controlled a vast area stretching from western Anatolia and the Levant to the Hindu Kush in the east, and from Central Asia to the Persian Gulf in the south. Ghiyath al-Din Muhammad, was sultan of the Ghurid dynasty from 1163 to 1202. During his reign, the Ghurid dynasty became a world power, which stretched from Gorgan to Bengal. Bahram-Shah was Sultan of the Ghaznavid empire from 25 February 1117 to 1157. Son of Mas'ud III and Gawhar Khatun, sister of Sanjar, sultan of the Great Seljuq empire. During his entire reign, his empire was a tributary of the Great Seljuq empire. Ala al-Din Husayn was king of the Ghurid dynasty from 1149 to 1161. He was one of the greatest Ghurid kings, and it was during his reign that the Ghurid dynasty rose to prominence. Ghiyath al-Din Mahmud, was Sultan of the Ghurid Empire from 1206 to 1212. He was the nephew and successor of Mu'izz al-Din Muhammad. Izz al-Din Husain ibn Kharmil al-Ghuri, commonly known after his father as Ibn Kharmil, was an Iranian military leader of the Ghurid dynasty, and later the semi-independent ruler of Herat and its surrounding regions. Baha al-Din Sam II was the fourth ruler of the Ghurid branch of Bamiyan, ruling from 1192 to 1206.
' Terken Khatun also known as Turkan Khatun was the Empress of the Khwarazmian Empire by marriage to Shah Ala ad-Din Tekish, and the mother and de facto co-regent of Muhammad II of the Khwarazmian Empire.